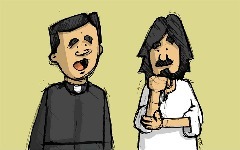 ​I would say that a priest is one of the best friends one could ever have. We know that we can trust him no matter what; he will always be there when we need him, and will care because he wants the best for all of us. Above all, the priest is called to be a friend of Jesus, to make him THE friend of friends. ​It is through this special relationship that the priest is called to be a friend to others, because he has learned from Christ what true friendship is. Yes, the priest also argues with Jesus every now and then over things he cannot understand or which are difficult. However, the best comes when they reconcile: that’s how friendship works. Think about your friends, who’s never argued with them? We’ve all had arguments with our friends! This is normal because friendship doesn’t depend on the problems we have but, on the contrary, is based on selfless love. “Faithful friends are a sturdy shelter; whoever finds one finds a treasure. Faithful friends are beyond price, no amount can balance their worth. Faithful friends are life-saving medicine; those who fear God will find them” (Sirach 6:14-16).